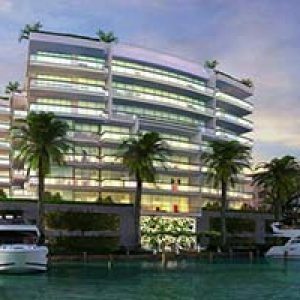 Opportunities are running out to own luxury waterfront property in Fort Lauderdale; however, units are opening up in Jackson Tower, one of Fort Lauderdale’s most established places for luxury living. Located in the heart of the city at 100 South Birch Rd., this thirty-story tower offers expansive views of the Intercostal Waterway as well as the Atlantic Ocean. At Jackson Tower, you’ll get the best of both worlds, riverfront property for swimming, boating, and relaxing on the deck, and you’ll be just blocks from the beautiful white sand beaches of Fort Lauderdale. Floor plans are available in six distinctive models ranging from two to three bedrooms. Prices range from $885k to $2.25MM and square footage ranges from 1,958 square feet all the way up to 3,500 square feet. There is no better way to get in on the action in Fort Lauderdale than a place at Jackson Towers. Jackson Tower was designed to compliment the surrounding landscape of South Florida and holds a distinct South Florida vibe from exterior to interior. Floor-to-ceiling glass windows and sliding doors line each and every residence and provide access to expansive wraparound terraces. Kitchens come equipped with imported European cabinetry and professional gourmet kitchen appliances and cook surfaces. Granite countertops provide a smooth finish to islands and surrounding kitchen surfaces. In the bathroom, residents may enjoy Jacuzzi tubs, and separate glass showers. Enjoy your favorite music with surround sound entertainment systems and stay safe with 24-hour security systems in place. Perhaps what makes living at Jackson Tower so special are the countless amenities available to full-time residents. The two-story lobby is perfectly landscaped and complimented with some of South Florida’s best original artwork; it is sure to make a great first impression on your guests. A secured parking garage offered two spaces for all residents, and 24-hour valet and concierge are available by request or at the touch of a button on your smartphone. Private elevators provide direct access to your residence or the promenade sun deck. Take a dip in Jackson Tower’s fifty-foot heated swimming pool, or work out in their fitness center which overlooks the Atlantic Ocean. The fitness center is home to his and hers locker rooms, a steam room and sauna, aerobics rooms, and state of the art cardiovascular equipment. Entertain guests or dine in the entertainment room. There will never be a shortage of things to do at Jackson Tower, but just in case, the best of Fort Lauderdale is right at your doorstep. Located just north of Las Olas Boulevard, residents can enjoy world-class dining, shopping, nightlife, and entertainment. Boutique shopping from world class designers as well as storefronts from your favorite name brands are all just walking distance away. Jackson Tower provides easy access to I-95 and other main thoroughfares in South Florida, putting you just minutes from Fort Lauderdale or Miami International Airport. Opportunities to own a piece of luxury in Downtown Fort Lauderdale are disappearing fast, don’t miss out on yours!